Home > Live with us > How much does it cost for retirees to live in a residence? Some of the most common and important questions when planning retirement are: "How much does it cost to live in a seniors residence?" and "Will I need to cover these costs myself and, if so, for how many years?" We’ve made you a list of what we consider the main budgetary considerations for your retirement. Please contact the residences that interest you directly to find out their rates. It’s also important to visit these residences to make an informed decision. Visiting will give you a good sense of the atmosphere and allow you to see the unit setup: various common areas, provided services, etc. This way, you can properly compare all aspects of the residences to determine which might be the best fit for you. Meals: A number of residences offer apartments with fully equipped kitchens, so that you can continue preparing your own meals if you would like. If you choose this option, there shouldn’t be any significant change to your grocery expenses while living in a residence. Most residences also offer the option of eating in the dining room if you would prefer not to cook. In this case, you will have to plan for additional fees, however you can probably expect your grocery expenses to be lower. At Le Groupe Maurice, meals are not included in the base rent, as most units come with a fully equipped kitchen which allows you to cook for yourself. If you would prefer to enjoy our excellent chef-prepared cuisine, various meal packages are available, ranging from à la carte options to monthly packages that include 1 or 2 daily meals. You can choose whichever option you prefer. Telephone and internet: Each residence establishes its own base package. For example, some residences provide landlines for local calls, while others don’t, and some offer internet connections in every unit, while others only have internet in the common areas. There are as many different options as there are residences, so don’t hesitate to ask about what is included. At Le Groupe Maurice, you're responsible for your own telephone and/or internet costs. This way, you can select the best package for your needs, or like many of our residents, you can use a cellphone in favour of a landline. Note that all common areas are equipped with wireless internet (Wi-Fi), and that cable TV is included in the base rent. Home insurance: Even if you are just renting, we strongly recommend taking out insurance. This insurance will cover your personal property as well as protect you from civil liability in the event you were to cause accidental damage to the building in which you reside. It even applies to your move into the residence. Ask about the insurance policies and requirements of each establishment when visiting the residences. At Le Groupe Maurice, we ask all of our residents to obtain home insurance. Note that since all of our residences are built with reinforced concrete and equipped with sprinkler systems, heat and smoke detectors, and camera and security systems, insurance costs are considerably lower than they would be for other types of dwellings, e.g. for a house. Parking: During your visits, ask about the options that are available in terms of parking, both for yourself and for your visitors. Some retirement homes only offer outdoor parking, while others are equipped with a garage. Costs related to leasing a dedicated parking space differ from one place to another. At Le Groupe Maurice, all our retirement homes have parking spaces for our residents’ car (in the garage and/or outside), and most complexes also have some outdoor areas for the benefit of visitors. When you purchase a condo in a residence, one parking space in the garage is included in the purchase price of the unit. For people living in the rental apartments with services, an additional monthly fee may apply for the rental of a dedicated parking space. Optional services: Residential life brings many advantages, including the fact of having access to additional services if needed: such as meals, housekeeping, management of your medication, support services and medical assistance, etc. The list of services offered varies greatly from one residence to another, so don’t hesitate to ask for the price list. For more information about our optional services, click here. 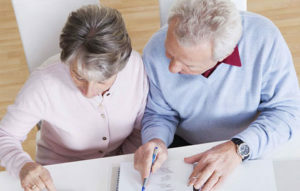 If you are 70 years or older and depending on your income, you may qualify for the tax credit for home support of seniors, a program offered by Revenu Québec. This program offers a tax credit equal to 33% of expenses that have been paid for services of home support, for example, housekeeping services, prepared meals, medical aid and assistance, etc. All the details about this tax credit are available on the Revenu Quebec website. Although all seniors 70 or over are eligible for this tax credit, regardless of whether or not they live in a residence, this program is particularly beneficial when renting an apartment in a residence, especially given the 24-hour nursing staff and various available services offered. All services included on your lease, and that make up part of your monthly rent, are eligible for this tax credit. You can get an estimate of your tax credit on Revenu Québec’s website, using their online estimation tool. You can also ask our sales and rental advisors to calculate your tax credit when you visit our residences. Feel free to talk to your financial advisor, accountant, or whoever takes care of your accounts, about the various tax credits available—you could save hundreds of dollars a month! Carefully planning for your expenses at the residence is an important and necessary step that will ensure you avoid any unpleasant surprises. It will also allow you to fully enjoy your new lifestyle with complete peace of mind. Feel free to ask us any questions you may have when visiting our residences. We’re here to support you in this process!